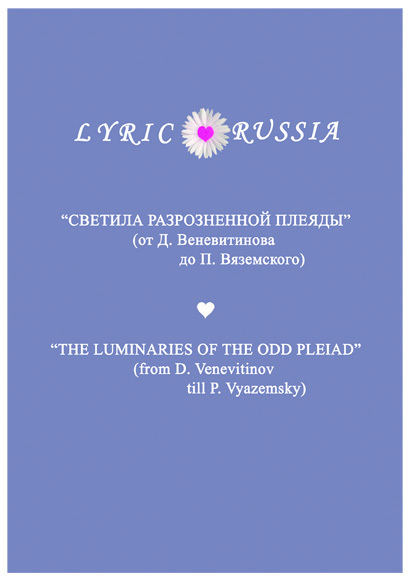 The “Lyric Russia” series («Лирическая Россия») is a complex of more than 750 carefully selected masterpieces of Russian lyric poetry in high-quality translations into the English (now international) language. The general purpose of this project is to familiarize the English-speaking countries and the people who have a good command of English – with the summits of poetical genius of Russia. 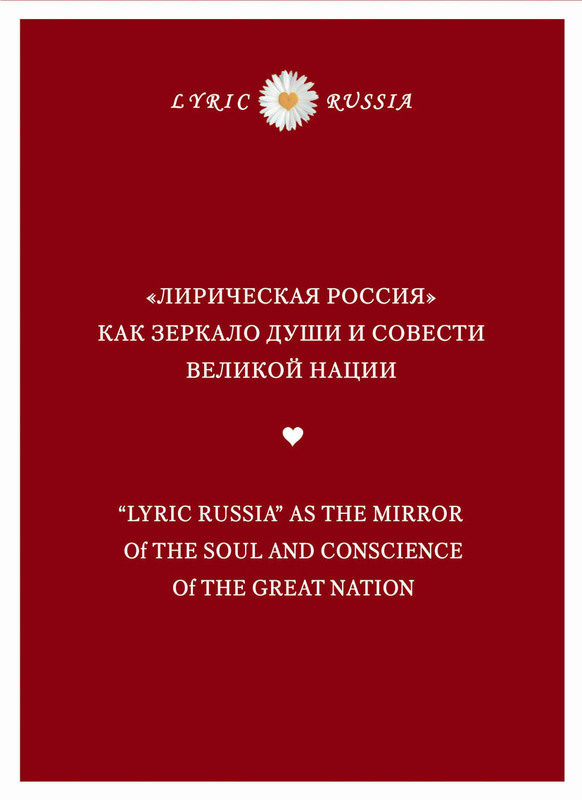 Three names included in the book of the “Lyric Russia” series cannot exhaust all the wealth of Russian lyric poetry, but these names give a comprehensive notion of what the Russian personality, the Russian nation and Russia itself are. Among the poets, who are included in this book, there are extremely gifted person-alities, who unfortunately failed to reveal and display all their gifts. So, Dmitri Vene-vitinov died when he was 21 years of age, he could write only 39 poems, but please read his “Prayer”… Even A. S. Pushkin would be proud to have this poem among his own. The same thing may be said about Pushkin’s closest friend – Anton Delvig, who lived only 33 years (the age of Jesus Christ). Evgeny Baratynsky and Nicolay Yazykov lived 44 years each. The 9 lyricist of this volume embrace the whole 19th century. “Like an ancient heathen priest creating a temple, populating it with gods and then during all his life serving and worshipping them, so Fyodor Ivanovich erected a magnificent poetical temple in his heart, put up an altar and upon it burned incense to his deity – the Woman. It should be said that any translator of love lyricism of such incredible emotional tension is required to show maximum psychological correctness and precision in the appraisal of the situation and in conveying the whole gamut of emotional details – without exaggerations or allowances. 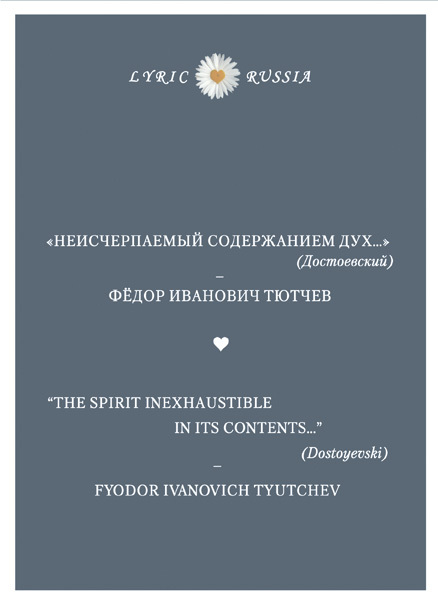 In this respect Tyutchev’s lyric poetry is probably of particular difficulty. One of the most important tasks of the translator was the adequate reproducing of both the remarkable sincerity of the poetic utterance and the glamour of the images. 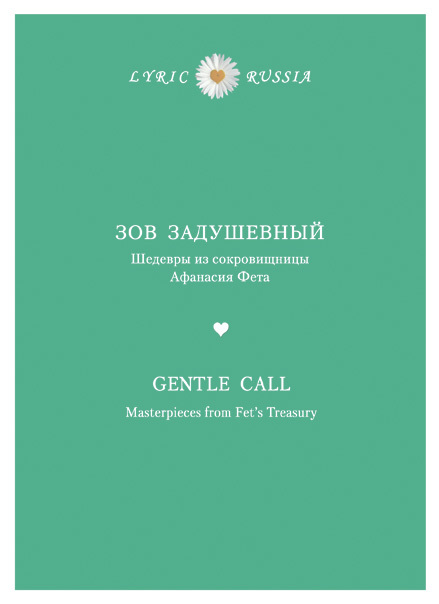 A. K. Tolstoy’s language is at the same time simple and exquisite, we feel in his voice the inexhaustible richness of popular intonations and the Herculean power of emotions. The reader shall feel the melodiousness and sonority of that voice, the finesse of the feelings devoid of any mannerism and fad taste. 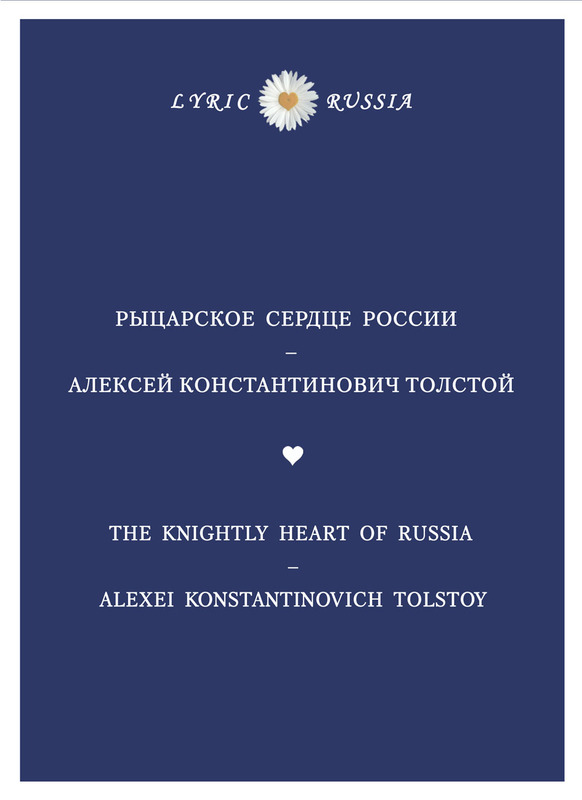 The presented book in probably the most important for the author of translations within the published series, since the most outstanding lyricist of this triad of poetic giants of the so-called “post-Pushkin epoch” is undoubtedly Afanasi Fet whereas F. Tyutchev is the most “philosophical”, and A. K. Tolstoy’s poetry is the most “knightly” in the sense of struggle for the triumph of ideals of justice and love. For Fet, the poetical flare-up is the primary method of comprehending the world, since it was through his creative work, first and foremost, that he philosophically interpreted the world. And, as a result, he has built his world of a spiritual ideal as a response to the “gentle call” of beauty, the world of such sublimity that is up to now accessible to but a few. The figure of K.R. in the constellation of poets is unique by the fact that it is precisely to him that Afanasi Fet passed on the poetical baton. The never-ceasing cordial and most affecting correspondence between them lasted up to the very death of Fet in 1892. 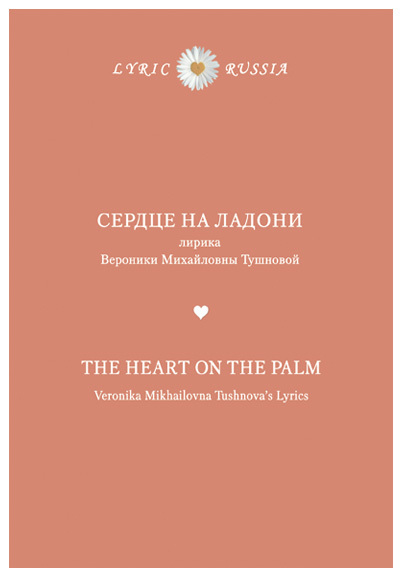 V. Tushnova’s poetry is a special realm, open to eye and ear, but it exists according to the laws of beauty; it is confessionality which has become something more than a confession, it is the voice of the beating heart. 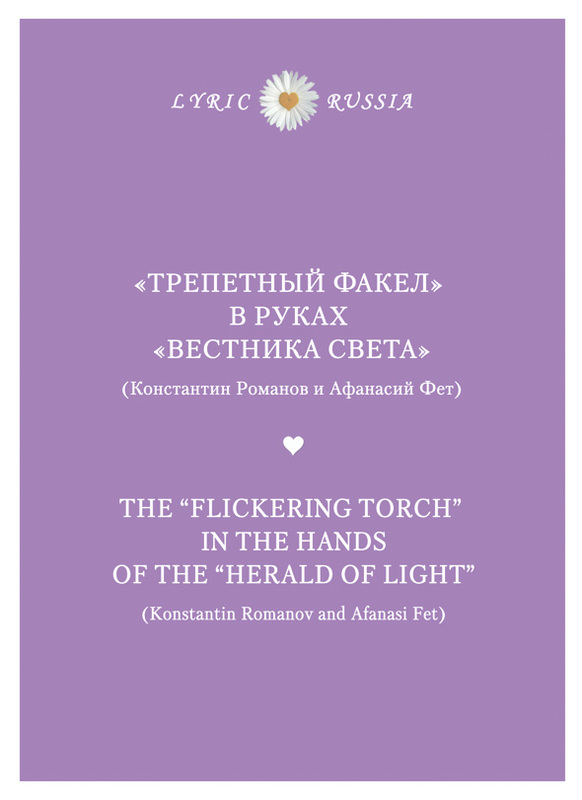 If we observe closely and scrutinize the poems by Veronika Tushnova of the latest period, we may notice that the whole dynamics of the author’s poetical thinking sometimes reaches such a degree of intensity and brightness that the very birth of an opus resembles the forming of a crystal in a saturated solution – many opuses of the poetess are really like crystals (even externally) shimmering in all their facets from within.